Coming in at #6 on the Tripadvisor® 2016 Travelers’ Choice list of the Top 25 Museums in the United States, the USS Midway Aircraft Carrier Museum doesn’t disappoint. Standing tall in the San Diego Bay, this impressive aircraft carrier is likened to a floating city on the sea and delights visitors year ‘round. During the sunlit-filled hours of the day, locals and travelers alike take pride in the nearly 50 years of military history showcased aboard this stunning vessel. And in the evening, the red, white and blue lights adorning the deck shine brightly across the harbor. A short drive from the international airport and Port of San Diego, the USS Midway Museum serves as a constant reminder of the symbiotic relationship that San Diego has with the military. 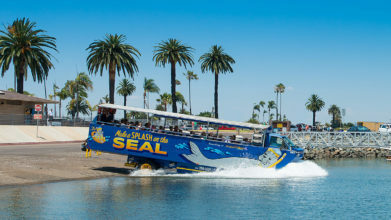 After a walk along the Embarcadero, purchase your ticket and climb aboard. A “Welcome Aboard” sign greets visitors as they enter. Once on board the longest serving naval aircraft carrier of the 20th century, guests can grab an audio guide and continue on their way. The price of admission includes a self-guided audio tour sharing details of over 60 locations. Stop at every one and your journey will take at least three hours aboard the carrier. There’s much to see, experience, read and tryout on all levels of the USS Midway. Yellow-capped docents will answer any questions you have along the way. Want to hear about their history with the military, know how something works, what it does or how a specific machine functions? Just ask and they’ll share their insightful knowledge with you. Between the audio guide and the docents, there’s so much information to learn about this naval carrier, its sailors and its history. Over 225,000 service members have served aboard the USS Midway. Once your headsets are on and you’re ready to enjoy your journey, the tour will take you from deck to deck wiggling through the ins and outs of the aft and starboard sides. Some of the many spectacular spaces showcased on the tour are the sick bay, combat stations, jail, laundry, mess halls, galleys, bridge, and quarters of all different levels of servicemen. From the tiny quarters of sailors to the large sized rooms for the Admiral, you can walk through the footsteps of history to feel what it was like to live, work and serve aboard this floating sea vessel. Families can take part in flight simulations, interactive exhibits, films, knot-tying exercises and conversations with military veterans. On a regular basis, World War II combat veterans are aboard the ship to speak to guests. Give a hug, shake a hand, take a photo or listen to a story – these revered veterans have much to share and much to teach. One activity not to be missed is the opportunity to go aboard aircraft. Head up to the flight deck to experience what it would be like to give the green light to release the planes. Climb into a helicopter or channel your inner Maverick from Top Gun and “feel the need for speed” in a fighter jet. Each aircraft has a unique name, purpose and capability and all are showcased throughout the carrier. Downstairs you’ll find flight simulators and more opportunities to jump in the cockpits to see what it feels like sitting in the driver’s seat of a military flying contraption. Before you head out, check out the many other opportunities offered aboard the USS Midway. From venue spaces for special events to onboard educational programs, this aircraft carrier provides information of seafaring history in a variety of ways. Teachers can plan real and virtual field trips, schools can receive professional development and you can even sleep overnight aboard the carrier. Find out about the many military ceremonies and the countless events open to the public. In the summer, be sure to check out the movie nights on the flight deck and join in for the celebration at one of the best viewing spots for the Fourth of July fireworks over the water. After visiting the gift shop, visitors disembark directly onto the Embarcadero footpath along the Bay. Turning right will take you towards Seaport Village, the Headquarters and the Gaslamp Quarter. Turning left will take you to the Maritime Museum with its tall ships and submarines. Head straight and you’re off to an adventure in the center of the city and can take you any way you choose to wander.